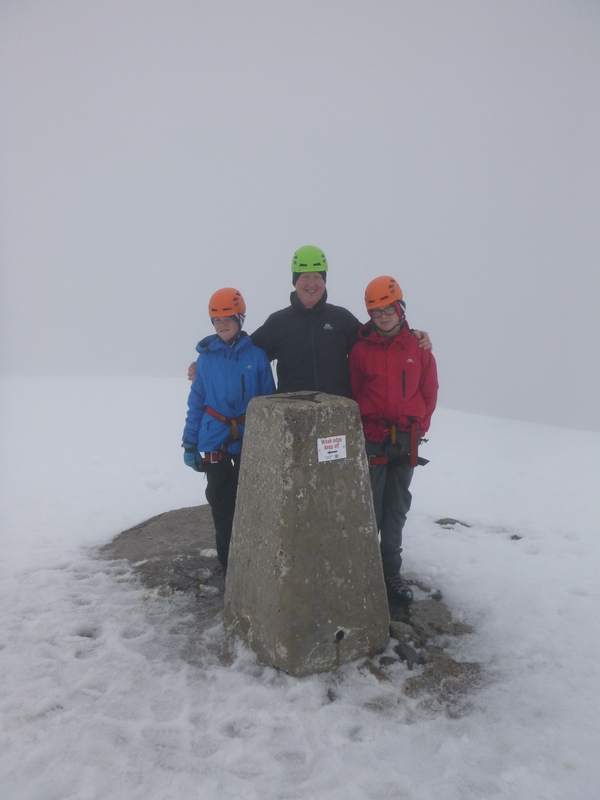 This week I have been working on Ben Nevis for Abacus Mountain Guides. 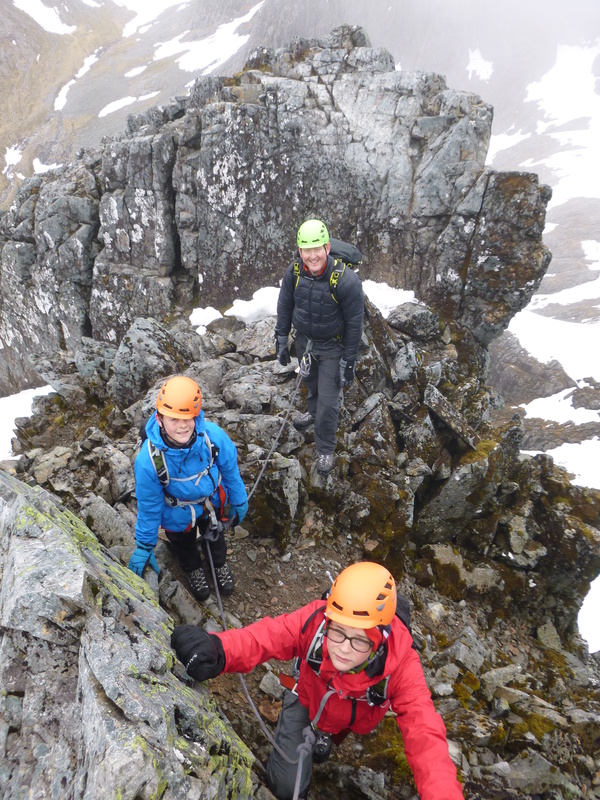 Tuesday I took Johnny, Henry and George up Ledge Route which was a little snowy at the bottom and top but great to see the young lads having so much fun. The meat of the route was free of snow and so we were able to make progress without crampons. 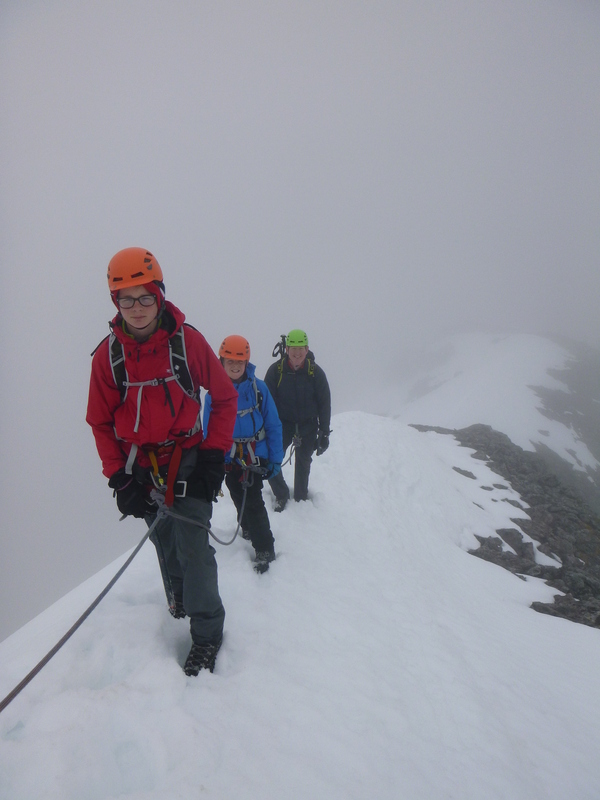 Wednesday I was working with Andy helping three fathers and their sons up the path with high hopes of topping out on the summit. 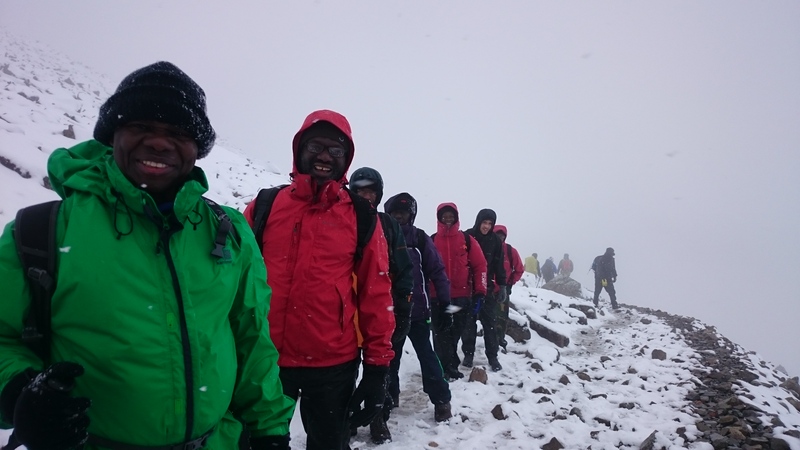 Quite a change in conditions today made the Maclean’s Steep very icy and so the difficult decision to turn everyone around had to be made, another great effort all round though. Finally, yesterday I was working with Martin leading 16 people from the ‘Black men walking for health’ group. I have to say when I read the mountain forecast for heavy snow then heard reports that corner three had snow on it early that morning I wasn’t feeling too optimistic. 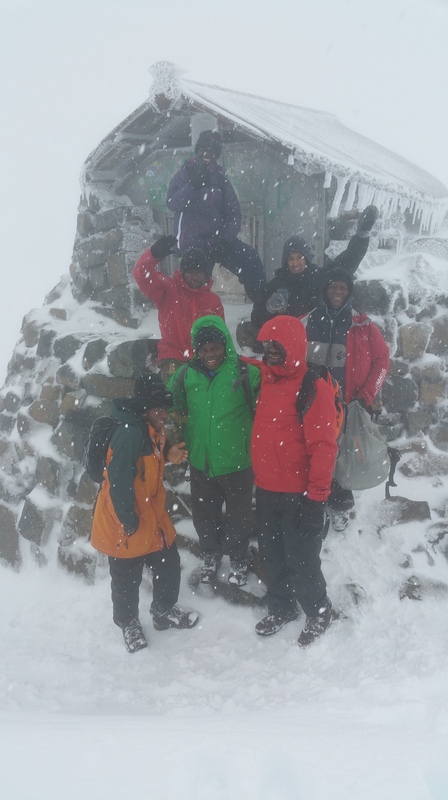 However, the group lost some people early on to tiredness, then another three a little higher up leaving me with seven keen and enthusiastic walkers ready to make the break for the summit. Lots of people gathered at the stone circle, all dithering or waiting to follow people who knew where they were going. It was a full on white out which required compass navigation to get us to the top. People behind us were shouting for me to slow down but I ploughed on with my guys keeping them as safe as I could. The summit trig is just sticking out of the snow, a testament to the winter conditions on the mountain. Again, more folk walking around aimlessly in the white out conditions, many too close to the North face cliffs. I spoke sternly to a family with their children who were asking ‘where’s the summit! ?’ , other members of the public (in shorts!) 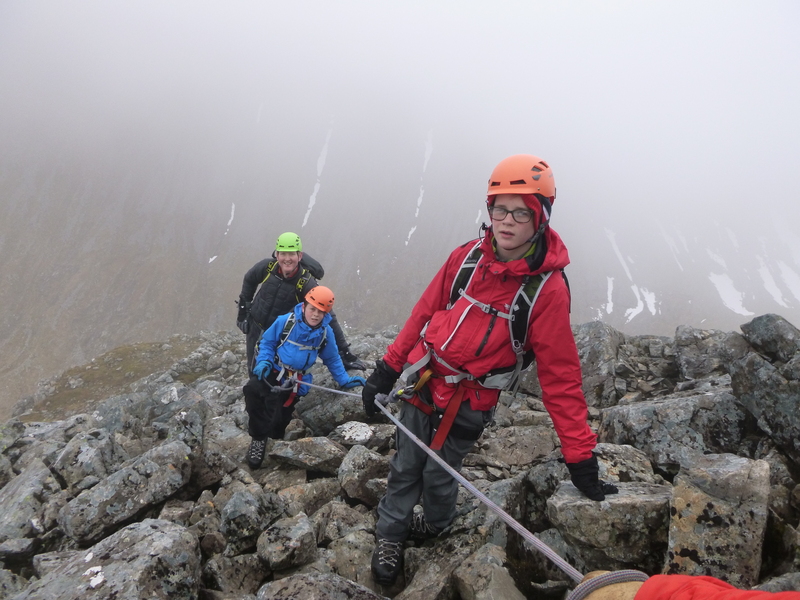 tagged on the back of my group to disorientated to go up or down on their own……….I am off to Skye tomorrow – lets hope the weather man is correct and delivers some fine weather for June!